Labrador Retrievers are America's Top Dog... Again! The results are in and once again, the Labrador Retriever has come out on top. Lab Ties Poodle for the Longest Consecutive Reign at #1 - The American Kennel Club (AKC®) announced its much anticipated annual list of the Most Popular Dogs in the U.S. today with the Labrador Retriever celebrating its 22nd year in a row as the most popular breed in America, tying the Poodle for the longest consecutive reign at number 1. Labrador Retrievers are the go to dog for many; both the United States and England have them as the most popular dog among those who register their pets. However, this is not a surprising fact since this breed is known for its energy, intelligence, loyalty and excellent temper. They are fit to all ages and all lines of work, including: disabled-assistance and therapy, tracking and detection, hunting. It’s no wonder that over 60% of all the dogs used to guide the blind are in fact Labrador Retrievers. You can probably spot a Labrador pretty easily in photos of the rescue efforts during 9/11. In fact, several dogs were responsible for saving, completely focused and selflessly, the lives of many during that painful day. Such is the case of Dorado, a yellow Labrador that served as the guide dog of Omar Riviera. Dorado guided Riviera down 70 stories of Tower 1 before it collapsed. In the middle of screams, noise and desperate running, the dog safely guided his owner who at some point tried, unsuccessfully, releasing him so he could run for his life. Dorado stayed by his master and saved his life. Jake, a black Labrador, was a wonderful rescue dog that started in this world in a rough way, abandoned with a broken leg and a dislocated hip. He grew up to be one of the 200 government certified rescue dogs of the United States. During the attacks of 9/11, Jake braved to walk at the World Trade Center among burning debris searching for survivors. Sirius, a yellow Labrador, was not a survivor of the attacks, since he heroically died waiting loyally for his handler to come back in one of the Twin Towers. Sadie and Zanjeer worked hard in war zones. Sadie saved dozens of lives of soldiers by detecting a bomb in Afghanistan. Zanjeer, during his service in the nineties, detected 57 country made bombs, 175 gas bombs, over 200 grenades and over 3,000 kg of RDX, among other great work. Sabi was a Labrador that was used by the Australian Government as a detection dog. He had been MIA (missing in action) in Afghanistan when he was found safe and sound over a year later in 2009. Ok, so these ones are not actually -real- but they are based on our favorite breed: Labradors! The famous smart-mouth talking Brian Griffin from Family Guy is a white Lab Retriever. His cousin Jasper, is a white Lab too. We’ve all enjoyed JD and Turk from Scrubs move their stuffed dog around and treat him like a live pet. Well, Roudy is a Lab! There has be really few people who did not go through a whole box of tissues crying over Marley, from Marley and Me! There was a reward for taking the lives of Lucky and Flo, twin black Labradors that helped find over 2 million copies of counterfeit dvds in Malasya. Beebo Charbonneau, a Labrador Retriever was worldly known for taking –illicitly- over 1200 garments, shows and socks in this lifetime. I told you they were hard workers! Famous Labrador Retrievers is a Guest Post from Eugenia Sincovich. Eugenia Sincovich is an Argentinean writer that can’t seem to stay in one place! She loves everything that reminds her that she’s alive and does her best to convey those feelings into her texts. She currently writes for iNetGiant. Jan. 25, 2013 - The Hartz Mountain Corporation is voluntarily withdrawing its Hartz ® Chicken Chews™ and Hartz ® Oinkies® Pig Skin Twists wrapped with Chicken for dogs in the United States because they contain trace amounts of unapproved antibiotic residue. Recent testing by Hartz found trace amounts of unapproved antibiotic residue in samples of the named listed dog treats. What products are included in withdrawal? Print out the listed coupon and visit your local Petco to get a Free 13 oz Can of Pro Plan Dog Food. Coupon expires 2/28/13. Dog Rescue Newcastle has written a 7 page document listing possible causes of skin problems and their solutions for those of you who have dogs that are scratching, itching or biting themselves. Your dog’s skin is an indication of her overall health and when a skin problem occurs, your dog may respond with excessive itching, scratching, licking and/or chewing. Scratching, rubbing, chewing, biting, and licking of the skin and fur will make your dog's life a misery. Inside the Skin Problems In Dogs: Causes and Treatments (PDF format) they will examine each of these possible causes and suggest treatments. Hopefully, after reading the information provided in the Skin Problems In Dogs: Causes and Treatments document and follow their recommendations, you will then have a much healthier, happier, and relaxed Labrador Retriever. Print out the listed coupon and visit your local Petco to Save Save $3 off Science Diet Dog Food. Coupon expires 1/31/13. 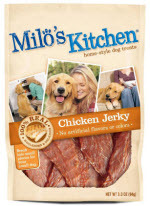 San Francisco – January 9, 2013 – Milo’s Kitchen® Announced that it is voluntarily recalling its Chicken Jerky and Chicken Grillers home-style dog treats from retailer shelves nationally. No other Milo’s Kitchen® products are affected. On Monday, New York State’s Department of Agriculture informed the U.S. Food and Drug Administration (FDA) and the Company that trace amounts of residual antibiotics had been found in several lots of Milo’s Kitchen® Chicken Jerky. After consultation with the New York Department of Agriculture and FDA, the company decided to voluntarily recall Milo’s Kitchen® Chicken Jerky and Chicken Grillers, which are both sourced from the same chicken suppliers. The use of antibiotics to keep chickens healthy and disease-free while raising them is standard practice in poultry production for both human and pet food. However, the antibiotics found in the products were unapproved and should not be present in the final food product. Milo’s Kitchen® has a comprehensive safety testing program in place for its products from procurement through manufacturing and distribution. Part of that program involves extensive testing for a wide range of substances commonly used to ensure the health of chickens. However, Milo’s Kitchen® did not test for all of the specific antibiotics found by the New York Department of Agriculture. “Pet safety and consumer confidence in our products are our top priorities,” said Rob Leibowitz, general manager, Pet Products. “While there is no known health risk, the presence of even trace amounts of these antibiotics does not meet our high quality standards. Therefore, today we decided to recall both products and asked retailers to remove the products from their shelves. St. Louis, Missouri, January 9, 2013 . . . Nestlé Purina PetCare Company and its wholly owned subsidiary Waggin' Train, LLC today announced it is voluntarily withdrawing its Waggin' Train and Canyon Creek Ranch brand dog treats sold in the United States until further notice. New York State authorities initially requested that the Company remove Waggin' Train and Canyon Creek Ranch chicken jerky treats from retail locations in the state of New York, which we have agreed to do. In addition, because of the differences in U.S. and Chinese regulations, Nestlé Purina decided to conduct a nationwide voluntary withdrawal. "All of us at Waggin' Train care deeply about pets and their owners, and the quality of our products is of the utmost importance," said Nina Leigh Krueger, President, Waggin' Train LLC. "Waggin' Train has served millions of pets and their owners very well. In the final analysis, our Company and our loyal consumers must have total confidence in the products we sell and feed our pets. Once we understand and determine how to comply with the technicalities of different regulatory frameworks, we will work with all appropriate parties to define the best way to supply the market." Nestlé Purina contacted the U.S. Food and Drug Administration (FDA) regarding NYSDAM's findings. There is no indication that the trace amounts of antibiotic residue are linked to the FDA's ongoing investigation of chicken jerky products. The trace amounts of antibiotic residue (in the parts-per-billion range) do not pose a health or pet safety risk. Nestlé Purina Announces Voluntary Withdrawal of Waggin' Train and Canyon Creek Ranch brand Dog Treats Due to Trace Amounts of Antibiotic Residue - Waggin Train Questions & Answers. It is beneath their beautiful fur coats that a world of uncomfortable and even painful skin conditions are often lurking. Dogs skin problems can be an indication of a more serious and even life threatening condition. Some of the most common dog skin problems are dry skin, usually indicated by the appearance of “dandruff” or excessive shedding, various fungus infections, mite irritations, mange, and rashes that may be the result of seasonal, environmental or food allergies. Other dog skin problems include tumors, seborrhea skin diseases, melanomas and infected sores. The fact is that many of these conditions are completely treatable and often preventable. Identifying the cause and preventing unnecessary dog skin problems is a responsibility that comes with the role of owning a dog. However, as a loving pet guardian, adequate care and treatment of an animal is a legal requirement. Some of the most preventable dog skin problems are caused by dog allergies. Dog allergies may be the result of seasonal conditions, environmental factors or symptoms of food allergies. Many dog owners are surprised to learn that food allergies are not always related to a new food or diet. A dog may develop intolerance to foods that they have been eating for years. It is not an unusual occurrence for a dog to develop a food allergy when their immunity system may be compromised. Adding a digestive enzyme to a dog's daily diet of a premium all natural food is many times all that is needed to heal the skin. Dog food allergies are often an intolerance to unnatural additives and preservatives. Seasonal dog allergies can include parasite allergies. Fleas for example are uncomfortable enough for a dog, but some dogs are particularly sensitive to flea bites. Although, fleas may be present at any time of year, it's the hot dry conditions of summer when they are the worst. Other possible seasonal allergy irritants are spring pollens and dust mites. Rural dogs are at risk of developing further seasonal allergies where crop dusting occurs, or when other such chemicals are used around the farm or surrounding properties. If your dog is uncomfortable and excessively chewing and biting his legs or rear end, scratching himself sore, or shows any signs or symptoms at all of a bothersome skin condition, please seek the advice of a veterinarian right away. Prevention is better than cure; the best premium all natural diet is the first weapon against dog skin problems and dog allergies. Dog owners should routinely check their dog's skin and feel for any lumps, bumps or other skin conditions. Janie is an avid dog lover with over twenty five years of dog care experience. She has written numerous articles on dog skin, nutrition and care. Helpful Dog Skin Conditioners: http://www.old-dog-treats-and-rawhide.com/dog-skin-conditioner.html. Join Petco for doggiepalooza throughout the month of January. Free training and grooming seminars will be offered on various dates for you and your doggie! "Get professional advice, tips and tricks to help make potty training easier for you and your puppy or dog during this fun, 30 minute seminar." Visit Petco on January 5th & 6th (at 2PM) for their Free Potty Training Seminars. Pedigree is offering a Free Sample of their DENTASTIX Treats. "DENTASTIX Treats are delicious and clinically proven to reduce up to 80% of tartar buildup*. Clinically proven to reduce up to 80% of tartar buildup*—a contributor to gum disease—when used as part of a daily oral care routine. The special texture of DENTASTIX Treats helps clean between teeth and down to the gum line. Look for the patented X-shaped treat. (*Average reduction was 47%)"